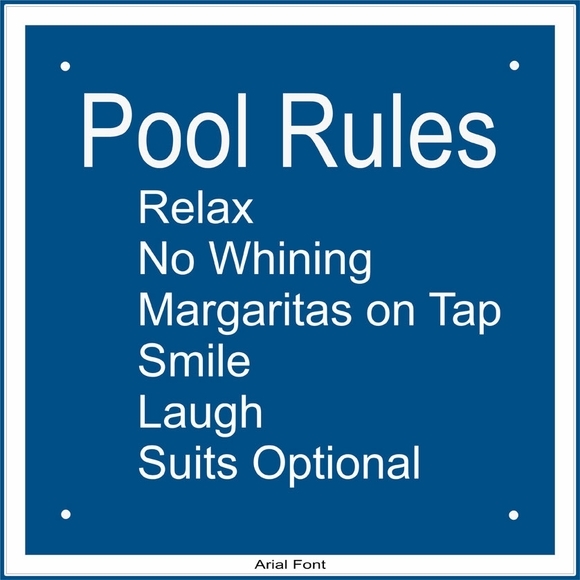 Personalized Pool Rules Sign - - custom made Pool Rules sign is an example of our Say Any Thing collection. 11.5" x 11.5". Made in USA exclusively for Comfort House. Square wall mount sign made from sturdy, UV-stabilized laminated acrylic with engraved personalization. Customized with the color you pick and up to six rules for your pool. Pool Rules is standard at the top. It's your pool. You make the rules. or sixteen (16) 0.5" characters. You don't need to use all six lines. Please leave any extra input boxes empty.